ONE common misconception and forgetfulness is that the consumers are only of products. But the service sector demands here an individual position. Amongst many services such as electricity, water, gas, telecommunication, cable services, cyber net etc., the only service which has received, to some extent, recognition in the CRPA 2009 is the health service sector. As to all other services which are more or less utilized by the people, (keeping in mind that not all people have easy access to the facilities) the Act is silent. Even this health sector has not been effectively addressed. Incase of financial or physical damage due to negligent/faulty service and fake as well as expired medicines, the individual possesses no capacity to complain to the competent authority. Only the council can notify the DG of the Health Directorate, and nothing more is said. Pricing of commodities is intricately related with many aspects of consumer rights. In most of the countries in Europe and America, the consumers actively participate in the process of pricing the products and services through consumer forums and representatives. Thus the whole process is democratic, reflecting the public opinion and public sentiment. The recent and much cherished CRPA 2009 has given no direction as to how the price is to be fixed, though it was expected that the matter would be addressed as the Act clearly states that over-rating of price is clear violation of consumer rights. Thus the manufacturers have the final say. Sectoral approach in the service field is a vital point. All the services used by the consumers are no doubt much needed; nevertheless, not all services are of equal importance and necessity. While medical service is indispensable for the people, beauty saloon or dry cleaning services may be put in secondary position in point of importance. The price, insurance etc. are to be set in accordance to the market demand. While most of the countries in the West have divided their service sector into various sections, the categorization has not been done in Bangladesh. One point worth mentioning is that, an injured consumer deserves immediate remedy. Lengthy disposal of consumer cases makes the injured consumer fall into despair. It spoils the freshness of the case, and ultimately frustrated the purpose of consumer protection legislation. To ensure timely redress, there is no alternative to a separate forum or specialized court to address the consumer cases only. The CRPA 2009 provides for the court of 1st class magistrate or the CMM to operate as the consumer court. The number of courts and judges in the country are at present far less than necessary. Thousands of civil and criminal cases are back-logged in the courts, taking unimaginably long time to be disposed of. In such a situation, it is nothing but utmost irrational and foolish to burden the already over-burdened courts and judges with rather new cases. The CRPA 2009 does not stipulate two-tier liability. It provides that if a seller sells any defective product with bona fide intention, he is not to be liable under the CRPA 2009. Now proving mala fide intention is in itself a hard task. As early as in 1932, in the famous case of Donoghue v. Stevenson it was decided that “The seller must have a duty of care to the End Consumer”. This has been overlooked in the CRPA 2009. It is to address such cases that the notion of strict liability came into application, so that intention need not be proved. But in stead of protecting the consumers, the CRPA 2009 seems to operate as a shield to the sellers and manufacturers. 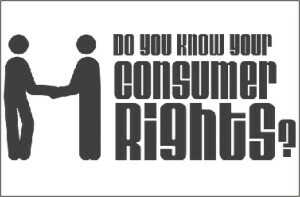 The CRPA 2009 ultimately leaves the consumer rights at the mercy of the bureaucrats. The whole process is being maintained by the consumer rights protection law and the Health Directorate. Needless to say, all the in charges of these offices are bureaucrats supported and nurtured by the government. The Act clearly states that the DG has the authority only to inform the Health Directorate. Thus the freedom of the council has been curbed quite a big extent. The health sector of the Republic is mainly standing on multinational companies and joint ventures. The DG himself has no discretion as to which complaints should be brought into consideration. It is quite simple to assume that these multinational companies have high level liaison with the top level bureaucrats. Thus they have high opportunities to influence the Health Directorate in taking its decisions. This existing culture is sure to impede the natural flow of the complaints being duly addressed. At the same time, there are now huge possibilities of corruption. As a general concept, litigation should be the last resort to seek justice. In all well built-up legal systems, consumer problems are mitigated by ADR (Alternative Dispute Resolution). The suits are filed when all alternative prospects have failed. But no such provision has been professed by the CRPA 2009. Quite interestingly, the suggestion was in the draft legislation prepared during the caretaker government, but failed to find its way to the final legislation. The field of advertisement plays a vital role in shaping the demands and mind set up of the consumers in today's capitalist system. Often the advertisements are exaggerated and highly misleading in order to allure the consumers to buy products which do not possess the publicized qualities. Many attractive advertisements of below-level products are prepared focusing on our country as the targeted market by the west, even India ( The Horlics promo of taller, Stronger, Sharper is a competent illustration, which after being telecast in the UK, was sued for not having the said nutrition value, ultimately Nestle apologized). The CRPA 2009 has no direction as to what should be done to address possible injuries resulting from misleading promos. All these lacunas are preventing the CRPA 2009 from playing the role of a catalyst in upholding consumer rights in Bangladesh. It is expected that the Government will with least possible delay bring necessary amendments and transform the Act into a more pro-consumer right and consumer friendly legislation. Arpeeta Shams Mizan is a second year student of Law, University of Dhaka.